SuperTuxKart, a Free 3D kart racing game recently released v0.8.1 with Wiimote support, new karts, modes and track. This tutorial is going to show you how to install this new release in Ubuntu 13.10, Ubuntu 13.04, Ubuntu 12.04 and enjoy the game. First check out system type (32 bit or 64 bit) under System Settings -> Details. Then download the portable version from the official download page for Linux. 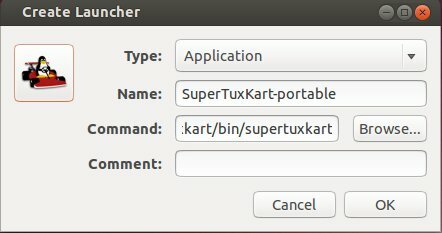 Icon: choose from /home/YOURUSERNAME/Downloads/SuperTuxKart/data/ folder. Once done, you can launcher the game from Unity Dash.